2013 Chateau de Lascaux, Rose, Languedoc, France. This fresh and bright rose from near Pic St. Loup is delightfully tangy and mineral edged with zesty red citrus, watermelon, succulent sour cherry and earthy strawberry fruits along with crushed stones, saline and a steely element. This is shaping up to be a summer time favorite and should be a staple for long hot days, perfect for brunch, picnics and warm evening sipping, this a great example of southern French dry rose. 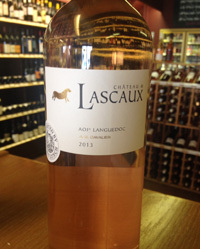 A hint of chalkiness and mouth watering acidity add to it’s stylish charms, for sure Chateau de Lascaux has their rose figured out and 2013 is one of their best effects to date, importer Kermit Lynch will not have a problem selling this pert pink wine out, so best not to wait and stock up while you can. This years cepage (mix of grapes) is made up of Grenache, Cinsault and Syrah, drink over the next 12 to 18 months.